UCOG Today [Paul Kieffer] » Blog Archive » "Take me out to the ballgame"
Some free tickets provided me an opportunity to watch a minor league baseball game. At Monica’s work someone donated free tickets to this evening’s Mobile Baybears baseball game. The Baybears are a AA team playing in the Southern League, and their opponent this evening were the Jacksonville Suns. 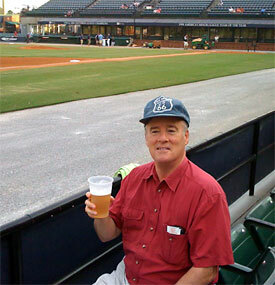 The Baybears play at the Hank Aaron stadium in Mobile, about a ten minute drive from our house. The ballpark was built for the Baybears, who were originally a San Diego Padres farm team but are now affiliated with the Arizona Diamondbacks. We had good seats just past the 3rd base dugout. The attendance was announced as being around 1000, but I estimated that no more than 500 people were present in a stadium that seats about 6000 people. One boy about 10 years old must have collected seven our eight baseballs in the upper deck since he had little competition in chasing down the foul balls hit into the stands. It was a pleasant evening as the Baybears won the game. I did notice that I have trouble following the ball from a distance without my eyeglasses, though.